Last Friday we traveled to the Finnish archipelago to spend the mid-summer holiday with my family at my father's summer cottage on the Holma island. I decided to stay for this whole week, working remotely over a GPRS connection. 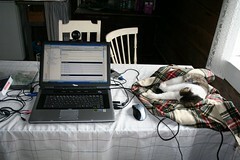 The picture on the right shows my desk with our younger cat, Möllis, sleeping cozily on top of the warm laptop power source. In related news, two weeks ago Yukatan got its first office. Since starting my own company in early 2005 I've been working from home, but from day one that was considered a temporary solution. Getting the office took a little bit longer than expected, but once I get back in town next week, I'll be working from an office room in Olarinluoma, just a 15 minute walk from our home.